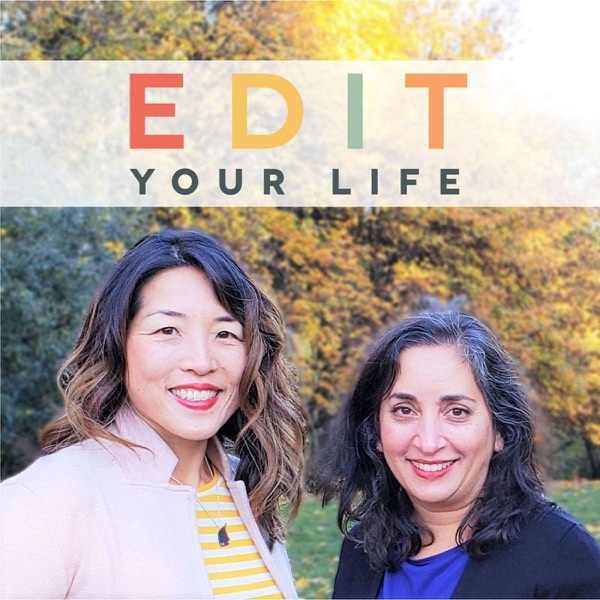 Christine & Asha, host of the Edit Your Life podcast, highlights changing your life for the better and more in this canât miss podcast! The host and expert guests offer insightful advice and information that is helpful to anyone that listens! Asha & Christine are moms at their core (which I love), but they're also motivating, funny, and authentic women changing the way other women see themselves and live their lives. Thanks for all the tips ladies - keep up the great work! I adore this podcast! I am not a mother (yet) but their are so many useful tips and insights and the narrators are so nice to listen to. They are so supportive of each other and any listeners and are always positive and funny. There is a wide variety of subjects and I love going back and listening to ones that particularly interest me. Thanks for the information . Iâm definitely trying some of your tips on limiting social media use . Iâm on my phone trying to read my book from the Kindle app and then i find myself 1 hour later scrolling down Instagram and Facebook ð­. Time wasted again. I have to change too ð. Thanks for the tips . I really like the idea of this, but felt alienated since everything they talk about revolves around motherhood. Listening to an episode of Edit Your Life is like free therapy for me! I so appreciate Christine and Asha's thoughts on navigating this crazy life that we lead and on putting things in perspective. I especially love that they call their tips at the end of shows "edits" because it helps to reinforce the idea that there's no quick fix to making life easier/happier and that it's all about taking things as they come. An edit doesn't have to be game-changing, it's not going to fix everything, but it's one small thing that you can do to feel like you're making progress. Thank you Christine and Asha!! Christine and Asha are phenomenal at expertly extracting those bits of gold listeners are looking for.Their interviews provide some incredibly actionable and compelling content, spotlighting the absolute best tactics on how to effectively grow your business and improve your life.Highly recommend listening and subscribing to the Edit Your Life Show if you want the knowledge and mindset to level up in all areas of life (and reach your overall business goals as a result)! I like the premise of this podcast and love the title. The hosts seem a bit earnest, and while I appreciate some of the content, the fact that one host has kids either in college or nearing college, and the other has two well-behaved girls shows me that their insights don't always hit home for me, a mother of a kid with classic ADHD and the resulting behavioral challenges. For example, one host has spoken against lots of afterschool and summer scheduling in favor of downtime, but without such heavy scheduling, my kid with behavioral challenge just defaults to a screen and wouldn't get the scope of sports, arts, learning and fun camp activites he enjoys and benefits from (and I wouldn't be able to work close to full time without ongoing, paid childcare activities and sitters). I find the issues discussed in the parenting podcast Best of Both Worlds far more relevant and relatable. Of all the family-centric minimalist podcasts, this is my favorite so far! I really value the co-hostsâ insights & perspectives. Their dynamic is great & I find them incredibly relatable! Keep it up ladies!!! I just love your podcast! I am originally from Boston and moved out to Portland, OR about 4 years ago. It is wonderful when you reference your areas because I can totally relate. I found your podcast after reading Minimalist Parenting and Parent Hacks both which were/are very helpful. I am fairly new mom (20-month-old) and now expecting my second in October. You have both helped to put: life, motherhood, being an entrepreneur, while balancing it all into a positive yet realistic perspective. Please keep the episodes coming they are very helpful. Thank you for all that you do. Nicole L.
To have two women like you: woke, mindful and real is what everyone deserves I. Those quiet moments when you need a boost! Thank you for your inspiring conversation that helps me truly curate my life in my own flavor, all while learning along with you! Asha and Christine authentically share a kind of compassionate minimalism that is both empathetic and productive, that encourages and coaches with little steps. It's modeled for me the kind of connection I had been seeking to cultivate in adult friendships and has helped me to really enjoy working/parent/creative mother life with radical acceptance. I've enjoyed seeing how making more confident choices has played out in revealing the best not only in myself but also in those around me. Yay for Edit Your Life! I love listening to your conversations. The topics are timely and interesting, and itâs wonderful to observe your friendship too. Iâve recommended your podcast to fellow teachers including our diversity and inclusion coordinator (I work at an independent school) and to my mom friends alike. Thanks so much for your honesty, embodied kindness and wit! I love the Edit Your Life podcast because there are real conversations about life, motherhood, etc. The conversations are deep, thoughtful, interesting- I get excited each time thereâs a new episode released & I often go back to episodes Iâve already listened to. Keep up the good work please!!!! Itâs always a joy listening to Christine and Asha! They have a wonderful rapport and share lots of practical ideas for making family life more enjoyable. I love the variety of topics they talk about and have also really appreciated the interviews they occasionally include. I love that each week there are new edits.Super actionable and helpful.I have also been introduced to so many new authors through this show.Gets better and better! What I love about this podcast is that these two amazing ladies have a lot of experience in life, careers, parenting, relationships etc. They also donât jump on the trendy bandwagons that go around and seem to stick to the tried and true and time tested. They also have a lovely chemistry and are a true joy to listen to. I really look forward to new episodes. Sometimes, oftentimes, you need a dose of heart and authenticity. Christine and Asha bring that to each and every episode. I finish listening feeling encouraged, empowered and hopeful about issues that I care about. Highly recommend! I love Asha and Christineâs calm tone and positive outlook, even when diving into deep, hard topics. I feel like they must be the most supportive, accepting people. I enjoy hearing their perspective and discussion! I look forward to your podcasts and love your stories. I dont feel alone, there are others who think and feel some of the same things I do. I appreticate your perspectives and candiness. Life is hard enough already, why complicate it? This parenthood thing is rough, fun, and painful at times yet making it that more rewarding. Thank you. Listening to Asha and Christine is like sitting down with a couple of friends. One of my favorite podcasts for sure! I have no clue how I stumbled onto this podcast but Iâm so glad I did ! I feel like Iâm sitting with the presenters having a chat , I can relate to a lot of what they are talking about , I have had many â aha âMoments. The topics are so close toHome and I have shared this podcast with a few friends. Right now Iâm binge listening to them , I really likeHow they arenât very long talks , yet fullOf info and advice. Great job! Good content. Sound quality needs improvement. I enjoy the content of this podcast. Sometimes the sound quality is not so great so itâs hard to hear or has an echo. I really appreciate the topics that Asha and Christine tackle and the wisdom, humor, and humility with wich they tackle those sometimes tough topics. I also like that they, as parents, are in different phases of their children's lives and provide insight into what the future brings for those of us with slightly younger children. These ladies take on some tough stuff, especially related to current events, and it's comforting to know that others have the same struggles. Definitely worthwhile for busy mamas. I love listening while doing laundry and enjoying probably luke warm coffee. Christine and Asha are a powerful duo, and come across as a pair of longtime friends that are at ease with each other, yet unafraid to tackle the tougher topics. I found their rapport with each other, and guests, to be conversationally easy and able to deep-dive into an episodeâs given topic. This is a great show for anyone, whether youâre managing a busy family or living solo â the take-aways are for everyone, and dispensed in an insightful way. Inspirational and provocative, and well worth your time! Asha and Christine's approach is so comforting, realistic, and practical. They are down-to-earth and relatable and I always find their podcast to be interesting and inspiring. Christine and Asha, you have such great insight to the heart of the matter, whatever the topic. I love that you both have so much wisdom but you can also be vulnerable and connect with listeners with the everyday struggles of running a busy household and business. Can't wait to hear more! This podcast is a godsend. Christine and Asha are so genuine and insightful. I look forward to this podcast all week long! Every topic they cover is interesting and the way they talk about it just makes you feel like you know them. When someone mentions Boston or Portland I automatically think, "Oh Christine/Asha lives there!" Like I know them :-) They put so much thought and care into their topics, you know you are getting real information from real people. Their voices are pretty fantastic to listen to as well ;-). I recommend this podcast to everyone!! I fell in love with these two via their book on Minimalist parenting. It feels like I read that so long ago and now I'm thrilled they have a podcast. I have listened to probably 80-90% of the podcasts. It's like listening to friends. They're so relatable and down to earth. The episodes are well-structured and captivating. Highly recommend! I ahve enjoyed listening regularly to Edit Your Life. It offers many realistic and balanced perspectives on how to prioritize and simplify day to day life. Great show will practical advice! Christine and Asha always discuss topics that are relevant and real. Forget faking it. Put aside pretending. They speak with feeling and compassion and offer real ways to edit your life. New listener but enjoying the wide range of topics and ideas. I've had plenty of conversations to my iPod, as if they could hear me lol. I listen while I'm running. I like how they have links and a genuine back and forth conversation for moms. I appreciate the time that goes into your podcast. Hands down, my favorite podcast. I tell everyone about this podcast because it has made such a positive impact on my life! Asha and Christine are infectious and their wise and forgiving nature make them feel like friends you've known and loved for years. Parenting can be lonely and terrifying at times but these ladies give great advice in an uplifting and motivating way that leaves me ready to take on the world again after every listen. Thank you!! Delightful, insightful, helpful. I love these gals! This is one of the few podcasts that I want to listen to as soon as a new episode is released. Thanks for doing what you do! So smart, wise, informative. Love their perspectives. Thank you! I discovered Edit Your Life when I missed a Bright Horizons webinar featuring Asha and Christine. I'm glad I followed-up. I enjoy listening to them chat on my long drives to work. They discuss parenting, organizing, and minimizing your life. They always provide great insights! Thanks, Ladies! I've probably listened to 95% of the Edit Your Life episodes, and it's become my favorite podcast. Asha and Christine keep things moving but linger enough over topics that you actually learn from them, mix personal anecdotes and professional advice, and somehow manage to run their podcast such that it's both professional and helpful and yet a genuine conversation between friends. Definitely worth your time for moms trying to focus on the important things. Great info, but the sound quality is terrible. I listen to this on a Sonos and its either to loud or I can't hear one of the ladies if the volume is normal. As a busy, working mom of four, I have found this podcast to be so helpful! Love how each episode of full of very useful, practical ideas. Solid, thoughtful, informative and entertaining content consistently each week. I love that I can take away a "next edit" for myself each week. Asha and Christine have such a warm tone. I would give this podcast five stars for content, but three stars for sound quality. That averages out to four stars. There is a tinny echo to each podcast that I have listened to, and I am sensitive enough to sounds and voices but I can't ignore it. Nor can I ignore the unpleasant diction and vocal timbre of the people speaking. That could be a mic issue, but I can't hear past it to the great info.For those who aren't as acutely sensitive to sound and vocal qualities as I am, this podcast probably contains many useful gems. Unfortunately, as sensitive as I am, I will have to avoid it and stick to more highly produced podcasts. I can't recommend this podcast enough. I'm wild about it...to the point I took multiple selfies (to get just the right one, of course!) for my Instagram picture to prove that I also binge listened to the show. #edityourlifeshow should definitely have MORE pictures associated with it! The advice and genuine relationship between the hosts is lovely. I adore the little tips and have implemented a lot of the life edits. I took the plunge recently and even started teaching knife skills to my 3yo. She's so proud! The hosts have taken me through multiple miles and if it weren't for a doula client suggesting a podcast as a good distraction I never would have even looked to this forum. You were my first download and my favorite! Don't delay. Subscribe! The two hosts are fun and friendly, and they cover the gamut of topics that are revelent to parents of elementary and high school aged kids- extracurricular activies, birthday parties, school lunches. I like their tips and just the general tone, which is helpful and positive.